The recommended way to update installations of Joomla! is to use the Joomla Updater component found in the Components menu of your site Administrator. Updating earlier versions? You must use the Install Method. You should always review Upgrading Issues and Known upgrading issues and solutions before upgrading. 3 When it has completed you may need to refresh your screen or empty your browser cache to adjust for template CSS changes. If an update is available there will be a message indicating this and a button to press. Which update you'll see depends on the setting for Update Server and caching. See options for Joomla! Update component. The first option shows the latest update of the major release in use. The second option shows the latest update of the latest major. Caching may cause not detecting an available update, purge cache. When it has completed you may need to refresh your screen or empty your browser cache to adjust for template CSS changes. Note: Joomla! will notify you on your Administrator home page (control panel) when an update is needed, but it will not do the update for you. You need to press the button to start the update. Back up your site before upgrading to a new version. That way, if something goes wrong during the upgrade process, you can easily restore your site to the earlier version. Review the release notes for the new version to be familiar with what was changed. Update using one of the recommended methods outlined in this document. These methods install the new program files, delete unneeded old program files, and update the database as needed for the new Joomla version. Clear your browser cache and check that the update was successful, using the steps outlined in the Checking Site tab. After an update, it is a good idea to clear your browser cache and check your site to make sure the update was successful. There are two quick checks you can do from the Extension Manager. This feature was added in version 2.5.0. It checks that your database is up to date with your Joomla! programs. In this case, press the Fix button in the upper right corner. 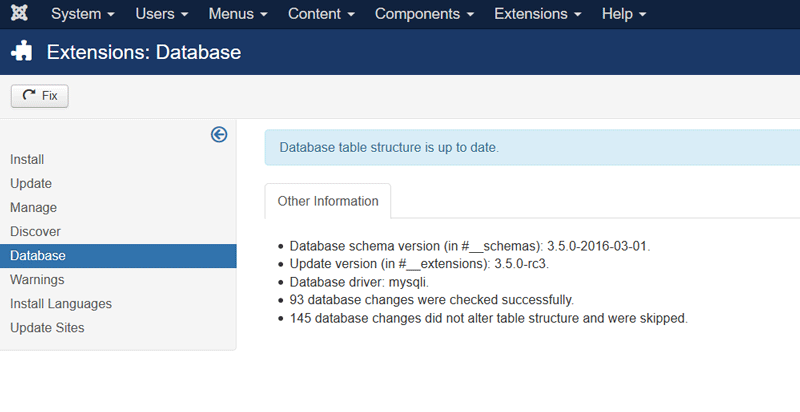 Joomla will update your database to correct the issues listed and then it will re-display the screen. If the fix was successful, the display will indicate that the database is up to date. N.B. If any errors still exist make sure all the database tables are checked in. If so, you know that any new extensions added during the update were correctly installed in the database. In this case, check the boxes and click on the Install icon in the toolbar. Joomla will install the extension(s) and then display the screen showing no extensions discovered. At this point, the new extensions have been installed in the database. If you have any questions before, during or after the upgrade, please ask them on the Migrating and Upgrading to Joomla! 3.x Forum. If you have problems or errors during the update process, here are some tips. If any database error messages show after the update, be sure to check the Extension Manager: Database tab followed by the Extension Manager: Discover tab. In some cases, if a database error occurs it will prevent all the database updates from running. In this case, you can run them from the Database tab and then use the Discover→Install method to check and install any new extensions. If you encounter any errors or problems during or after the update, be sure to check the FAQ for the version you updated to. For example, for version 3.1.0, this will be an category entitled Category:Version 3.1.0 FAQ. This page was last modified on 15 March 2016, at 10:17.